Emily Remler Advanced Jazz And Latin Improvisation download. 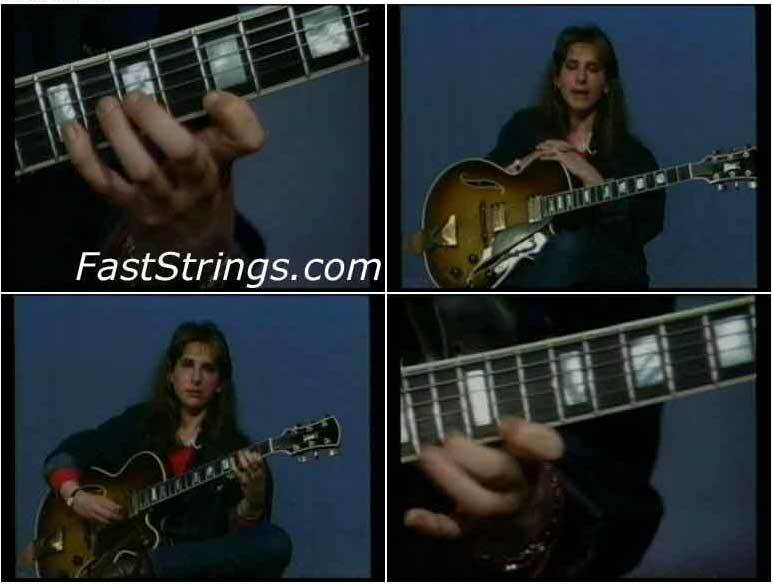 This hour-long video with Emily Remler covers some of jazz guitar’s most important topics, such as true Bossa nova style, samba rhythms, unique chord positions, alternating bass lines, syncopated guitar parts, passing chords, jazz minor scales, arpeggio licks, learning to put various scales over certain chords, eighth-note improvisation, II-V progressions and V-I resolutions. There are more musical examples in this DVD, with plenty of licks and a clear explanation given for playing over ‘Type 1’ and ‘Type 2’ dominants; play Melodic minor from 5th for Type 1 (non-resolving) and play Melodic minor up half step for Type 2 (resolving). Some of you will know this is same as Lydian-Dominant and Altered, but Emily gives great explanations of 9 and 13 natural tensions, #11 spice and avoiding ‘whitebread’ sound by not starting on root. In this video, you first learn the CORRECT way to play bossa nova and samba rhythm. Thanks a lot for the site!! I was posting a link to the booklet! What a shame that she felt the need to take illegal drugs. They’re illegal for a reason. Rest in peace, Emily.